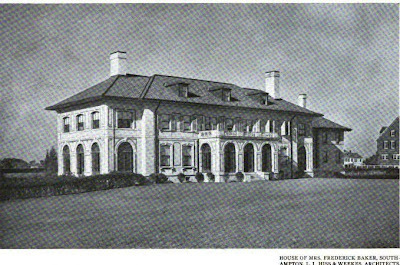 The Mrs. Frederick Baker residence designed by Hiss & Weekes c. 1915 in Southampton. The house was destroyed in a fire some fifty years ago. If I am not mistaken ... Mrs Baker, formerly Mrs George Lake, also lived at 815 Fifth Avenue. 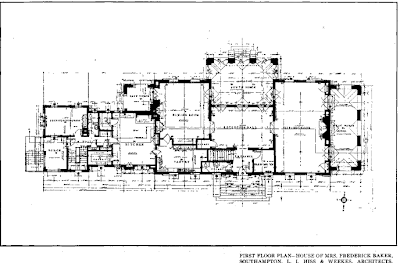 Her daughter Frances Lake married, in 1902, Dr John Seymour Thacher, and their son John Seymour Thacher Jr became the director of Dumbarton Oaks. 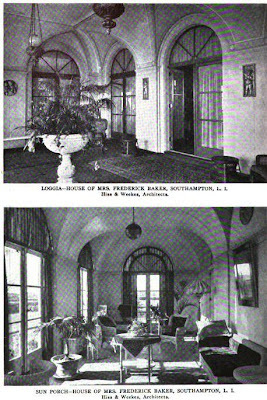 Mrs Baker's youngest son Harry Lake married Marie Ziegler, in 1898; she was the daughter of the landlady of the deluxe Hotel du Jardin in Paris, and the wedding, said the Times, was "certainly a surprise." And Mrs Baker's first husband, George Lake, was a partner in Lake & McCreery, a fashionable drygoods store in NYC.